TheAlarm.com is pleased to report that following The Alarm’s return to the UK, Mike Peters is now back on the road to making a full recovery. 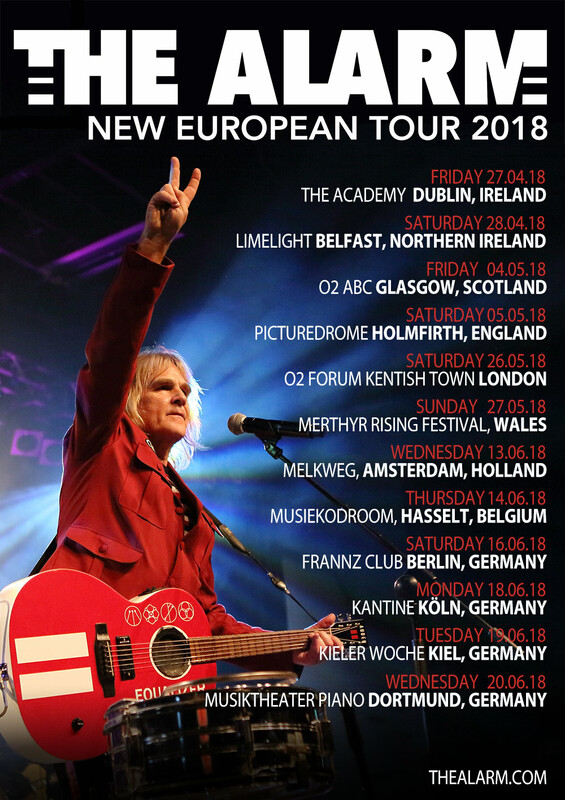 Mike Peters and The Alarm will resume the European Tour on June 13th and all the dates are available below. Ticket links will become active shortly. The new date for Amsterdam on June 13th will be held in the larger and increased capacity – Melkweg venue, which will allow even more fans access to the Dutch show that had originally SOLD OUT months ago. Since arriving back in Wales, Mike Peters has visited the Alaw unit at Ysbyty Gwynedd Bangor Hospital, under the watchful eye of his long-term Haemotologist, Dr. Edwards. After blood tests recently, it was established that Mike has suffered a severe drug-related allergic reaction which affected him so dramatically whilst on tour in Germany. This reaction is now abating and with some prescribed RNR (rest ‘n’ relaxation… not rock ‘n’ roll! ), Mike will be back in action next month, fit and ready to resume all his responsibilities as singer and guitarist with The Alarm. Mike, and all of us in the Alarm family, want to thank each and every person who has sent in messages of goodwill and support during this testing time. It is humbling to see so much positive love and compassion shown, and Mike has vowed to come back stronger and ready to carry the excitement of these new Alarm times forward and onwards into the remainder of 2018. Here is a list of all current Mike Peters and The Alarm shows for 2018 so far.